New university robotics kit and curriculum from Texas Instruments equips future engineers with a foundation in systems-level design. Photo courtesy of Texas Instruments. DALLAS–To stay competitive in a world increasing in complexity and efficiency, today's engineering students must graduate with an understanding of engineering concepts across multiple disciplines and products. 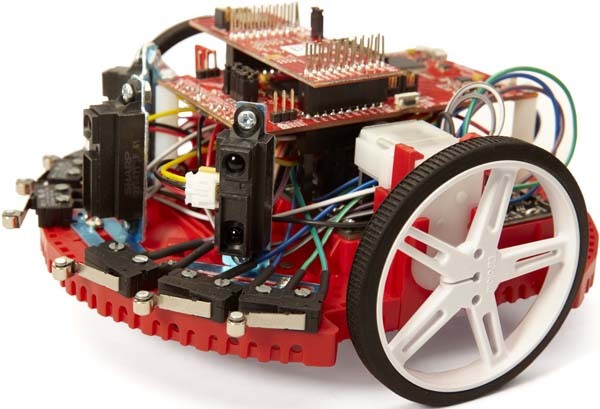 To equip future engineers with this strong foundation in systems-level design, Texas Instruments (TI) recently announced a new educational program for the university classroom, the TI Robotics System Learning Kit (TI-RSLK). The TI-RSLK is a low-cost robotics kit and classroom curriculum that provides students with a deeper understanding of how electronic system designs work. The first in the series, the Maze Edition, has more than 60 electronic and mechanical components, including the SimpleLinkTM MSP432P401R microcontroller (MCU) LaunchPadTM Development Kit. TI's SimpleLink MCU platform is reported to be the broadest portfolio of connected ARM® MCUs in a single software development environment, delivering flexible hardware, software, and tool options for Internet of Things (IoT) and robotics applications. Through the curriculum, students learn the function and purpose of each hardware and software component included within the TI-RSLK system. With this groundwork, students can write and develop their own code and then build their own fully functioning robotics system. This learning journey culminates in a robot that can complete line-following challenges, compete against other TI-RSLK robotic systems, and solve its way through a maze. "Whether taught as an introduction in the freshman year or as an advanced design lab later on, the TI-RSLK is an effective means for students to get a hands-on learning experience of engineering concepts that span electrical, mechanical, and computer science systems," said Jon Valvano, Ph.D., an electrical and computer engineering professor at The University of Texas at Austin, who developed the TI-RSLK with TI. "This not only encourages many students to pursue an electrical engineering degree in the first place, but to also persist in their field of study as it gets more challenging." Designed to supplement university faculty curriculum, the TI-RSLK Maze Edition comes with 20 learning modules covering basic to advanced topics. Each module is complete with lecture videos and slides, lab documentation and demonstration videos, quizzes, and classroom activities. The kit and curriculum is fully customizable, allowing faculty to choose how they integrate the TI-RSLK into their class. The TI-RSLK is targeted to teach embedded systems and applications, and can be expanded and used in a variety of engineering classes at any level along a college student's learning journey. "Future engineers can't push the boundaries of technology unless they first understand what the boundaries are," says Peter Balyta, Ph.D., president of TI Education Technology and vice president of academic engagements and corporate citizenship. "I'm confident that as students gain a stronger understanding of how electronics systems work, once in their career, they will create the technologies of the future that will astound us all." BoosterPack, LaunchPad, MSP432 and SimpleLink are trademarks of Texas Instruments.